I happened across the following photo on Twitter (photographer unknown, but it looks like the work of Rudi Mailander or, perhaps, Jean Sejnost) of this Alfa Romeo 6c2500 SS. Google image search revealed no result, and subsequent dives into various archives found no matches in the entry lists for the Mille Miglia, Monte Carlo Rally, or the Coppa d'Oro delle Dolomiti. The lack of a plaque eliminates the Coupe des Alpes and Liege-Rome-Liege. And the 6c2500 SS coupe wasn't introduced until 1947. So, I leave it to the Nostalgia Forum hive mind for answers. Any help that you can provide regarding the event and drivers is greatly appreciated. Thanks. The scenery looks a lot like Passo di Gavia. Isn't there something like a rally plate on the right of the nose? Edited by proviz, 29 January 2019 - 09:22. Landscape and stones could fit well to one of the Austrian or Yougoslavian Alpine Rallyes, like for example here , but I could not find a match for the number. The highest start number ever was #186 (Fiat 1500/1947). an Alfa Romeo 6C 2500 and a similar car plate in the same spot. Clearly the typical small Italian licence plate, NOT a rallye plate. Just a very tiny info. "Clearly the typical small Italian licence plate, NOT a rallye plate." Sorry, my mistake - saying left as looking at the photo - I meant higher up the nose on the RIGHT side, as looking through the windscreen. I think that’s the number 256 again, as on the left-hand door. One of my Facebook cohorts found the original source of the image, with a possible solution to the who/where/when. 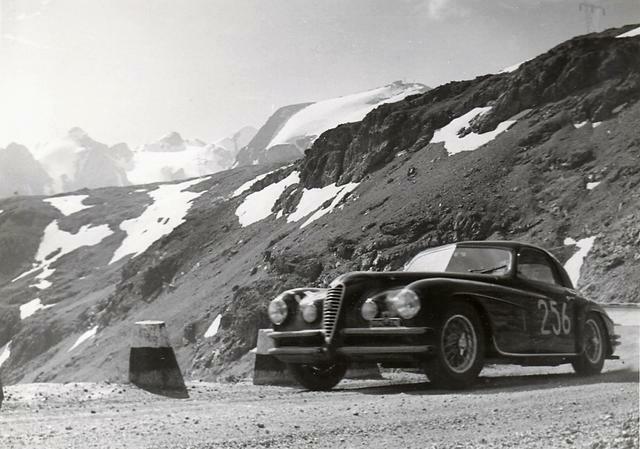 I don't have a copy of Martin Pfundner's Alpine Trials and Rallies to verify my hunch, but I'm thinking it's the 1951 Stella Alpina. Eugenio Lubich "primo nella classe oltre 1100 cmc. su Aprilia"
Eugenio Lubich, Lancia Aprilia 1500, 1st "gruppo Lancia-Aprilia 1500"
Edited by Rupertlt1, 30 January 2019 - 23:50. Still worrying away at this #256 Alfa. Valenzano/Sposetti (Alfa Romeo 2500), but were they in a Lancia Aurelia 2500? Held in September/October, so could be snowy in the passes? Number of entrants? Final stage: Merano to Monza, via Turin, Sestriere. Edited by Rupertlt1, 14 February 2019 - 14:45. Note this rally ran without an identifying plate on the front. Edited by Rupertlt1, 02 February 2019 - 21:47. I ran into Alfa Ronny (who some here may recognize from the AlfaBB forums) on FB. He stated that the photo was taken at the 1951 Trento Bondone hillclimb. I haven't yet located any additional information to corroborate his statement. Yes, really cannot fit it in the Trento-Bondone stretch. None of the scenery there looks like this, as far as I can remember. This seems higher up too. Much higher - as in "above the tree line..."
Fairly certain that it would have been mostly tarmac by the early 50s, though cobbles may have remained on higher hairpin bends. Can it be something like Aosta - San Bernardino? Edited by uechtel, 11 February 2019 - 10:09. At the expense of stating the obvious, the number looks to be painted in the Mille Miglia hand-painted style. I assume the MM never went so high, but does that indicate either that the pic is in Italy, or is of a car not racing but still wearing its warpaint? Hand-painted numbers were normal in those days, I'd say. What other sort was available? Well, there were the fablon templates that were common in British racing at the time, and without those you could paint the numbers on yourself. But the only place I've seen that particular handpainting is on MIlle Miglia cars. I don't remember sticky-back plastic being available before about 1960 and also don't remember people using templates when painting comp. numbers. Doesn't mean I'm right, but I do remember the number painter being a vital member of the organising team of any race meeting. Edited by Rupertlt1, 11 February 2019 - 14:07. None of those go near the tree line. #68 Franco Rol, Turin, (Alfa Romeo 2500); #82 Vicentini (Alfa Romeo 2500) - is he Emilio Vicentini? It is not the 1954 Giro automobilistico della Sicilia as we see a number 256 Alfa Romeo in this film at 1:07, but not the right type! Edited by Rupertlt1, 14 February 2019 - 15:13. If you go to www.TinEye.com and enter this photo, it may well pull up its original source. Worth a try.